Philippe Gaubert is a key figure in Parisian musical life in the first third of the 20th century. The focal point of Gaubert's challenging compositional work are solo and chamber music pieces for and with flute, along with ballets, orchestral works, a not unsubstantial number of Lieder and two operas, Sonia and Naïla. 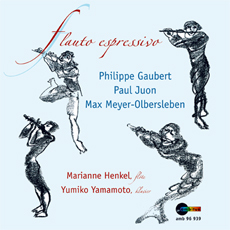 The fact that Gaubert was a contemporary of the most prominent Impressionists is audible in the rendering of this the first of his three flute sonatas. It was written in 1917 and is dedicated to the memory of Paul Taffanel. Gaubert was more reserved than, for example, Debussy and Ravel when it came to new developments. He attached more importance to lyrical colouring and used, as also in this sonata, the sometimes highly virtuosic accomplishment of French piano chamber music, such as is used by Gabriel Fauré. His main focus, as his personal ideal, lay in the question of tone production. Paul Juon's first flute sonata op. 78 (1924) accurately reflects (and is therefore exemplary) the compositional situation of it's time. Strongly in the foreground is the accentuation of rhythm, along with a harmony reminiscent of expressionism. Distinctly modern and late romantic traits mix with one another. The influence of Nordic and eastern national styles is unmistakeable. Behind all these accidentals is the reminiscence of the 19th century with the new ways of the 1920s. An encyclopaedia described Max Meyer-Olbersleben as “a German composer and pianist”. His works are not so touched by the developments in Europe of that time. His sonata op. 17 presented here however, shows in all senses a clear-cut individual picture. Calling it “Fantasie-Sonate” releases the composer from having to follow a prescribed form and allows him to set a quite individual foundation: utter virtuosic playing and craftsmanship on an equal basis. Meyer-Olbersleben offers just about all kinds of virtuosity for the flute.